Dave Scott dives over for a Batley Bulldogs try. Batley Bulldogs produced a near faultless display as they put Sheffield Eagles to the sword to record a 70-12 victory in the Kingstone Press Championship last Sunday. A 2,000-plus crowd were treated to Batley’s best display of the season as they ran in 11 tries, while stand-off Patch Walker had a perfect afternoon with the bott, landing 13 goals from as many attempts. Winger Wayne Reittie led the way with a four try blast, while there was a brace apiece from Walker, Dominic Brambani and Joel Farrell. Incredibly 50 of the 82 points were scored up the slope, with Batley scorching into a 38-0 half-time lead on a blistering host day. It took Batley 11 minutes to hit the front as back-to-back penalties put them on attack and a lovely passing move saw Reittie finish it off withthe try, which Walker improved. Batley moved back up the slope and Brambani wrong footed two defenders with a terrific side step to dance over between the posts. Brad Day was judged to have bounced the ball in the act of scoring from batley’s next attack but it wasn’t long before the Bulldogs added a third try as Day stormed through thev defence and sent supporting full-back Dave Scott over. Reittie intercepted Simon Brown’s pass and stormed 60 metres to grab his second try and three more Walker conversions extend the lead to 24-0. Alex Rowe launched another attack as he drove in and offloaded and the move was finished off with Walker scoring and adding the goal before also tagging on a penalty. Batley ended a perfect first half performance with a sixth try as Scott sent Reittie into space and racing away for his hat-trick, with Walker again converting for a 38-0 interval lead. Sheffield responded four minutes after the re-start as Perry Whiteley forced his way over and Jack Owens converted meaning all 44 points scored had come up the slope. That trend was halted two minutes later as Farrell stormed throyugh the defence and away for a try which Walker again improved. Walker launched another Batley attack with a 40-20 kick and Brambani darted over for his second try which his half-back partner converted to bring up the Bulldogs half-century. Farrell burst through the tiring Eagles defence for his second try after 65 minutes. Sheffield responded as Flynn and Blackmore combined to send Remy Marginet over for a debut try, which Owens improved but Batley responded by scoring a further 14 points in the final five minutes. Reittie beat a defender and stormed away for his fourth try, which Walker converted. Scott then broke through and sent Walker racing over for his seond and the Bulldogs 11th try of the game. 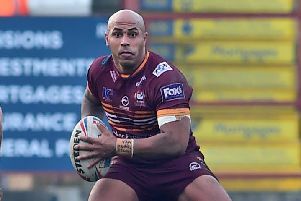 Walker converted and tagged on a last minute penalty for a personal haul of 34 points to cap a magnificent Batley display.